BUTLER PLAZA 44 • SHOPPING CENTER BUSINESS • August 2018 Y esterday's pundits taught that the key to developing a successful shopping center was "location, location, location." 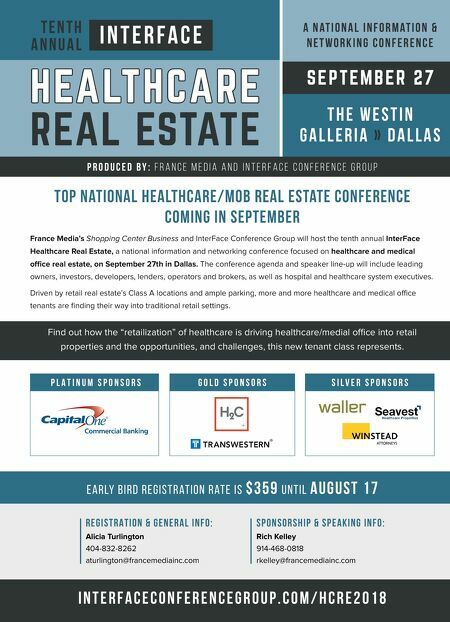 However, today's competitive, multi-channel retail suggests that brick and mortar retail estate must include "evolution" as fundamental prin- ciple for success. Butler Enterprises President Deb- orah Butler says, "Today, it takes both. Your physical center needs to constantly evolve to meet the contin- uously changing needs of both your retailer and your consumer. You owe it to them to stay in tune and learn what obsolescence is — don't look at how things are now, but decide early on, in our case over 40 years ago, how to position yourself for the next sever- al decades of growth and evolution." The culmination of the company's philosophy is a 267-acre, multi-dis- trict retail development located in the epicenter of North Central Flori- da's 14-county market at the Gaines- ville I-75 exit, just minutes from the six-hospital UF Health medical com- plex and 50,000-student University of Florida. The current development of the 450,000-square-foot, mixed-use But- ler Town Center at Stengel Field con- tinues its rolling restaurant and retail openings through 2018 and 2019. Butler Town Center is the capstone to the 2 million square foot development that includes the 750,000-square- foot Butler Plaza and the more recent 750,000-square-foot Butler North, providing three distinct, interlinked shopping neighborhoods. Whole Foods Market, one of the first new-to-market stores to open this past May at Butler Town Center, set the tone, drawing a record crowd of 2,000 customers lined around the building prior to opening. "When we partnered with Butler Town Center, we knew that we were a part of a vision that would provide the Gainesville market with a shop- ping experience unlike anything it had before," says Mario Torres, store team leader for Whole Foods Market in Gainesville. "We have exceeded even our own expectations and served customers from near and far who are thrilled to have this center as a desti- nation in North Central Florida." Eatertainment — the concept of food as entertainment — is one of the ba- sic constructs for Butler Town Center. Already opened or opening in 2018 — in addition to Whole Foods Mar- ket with its expanded eat-in or eat-out concepts — are a series of restaurants, most with street-side patios, includ- ing Bonefish Grill, Grub Restaurant and Bar, P.F. Changs, Irish 31, with additional restaurant letters of intent out for signature. In all, Butler Town Center, Butler North, and Butler Pla- za will have over 50 different dining options from which to choose. Thriving local and regional concepts mixed with nationally innovative fa- vorites is the merchandising mix im- plementation at Butler Town Center. 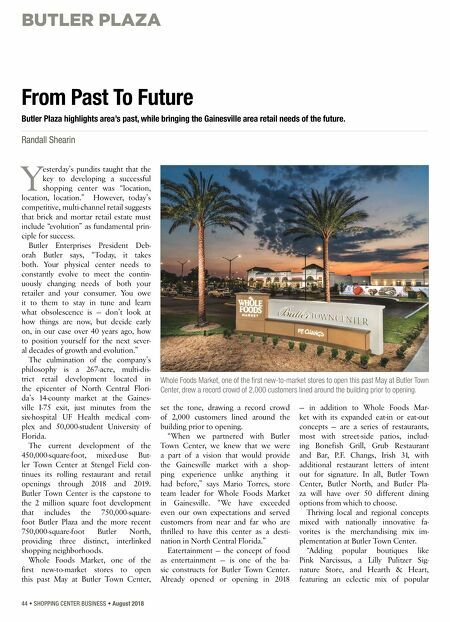 "Adding popular boutiques like Pink Narcissus, a Lilly Pulitzer Sig- nature Store, and Hearth & Heart, featuring an eclectic mix of popular From Past To Future Butler Plaza highlights area's past, while bringing the Gainesville area retail needs of the future. Randall Shearin Whole Foods Market, one of the first new-to-market stores to open this past May at Butler Town Center, drew a record crowd of 2,000 customers lined around the building prior to opening.